Wall Street is living and dying on every trade headline, underlining how sensitive investors are to the threat of a full-blown trade war. Stocks soared on Monday after news that American and Chinese officials are holding behind-the-scenes talks aimed at averting a trade disaster. Only days ago, President Trump's crackdown on China's trade tactics and fears of retaliation sent the market to its worst week in two years. The head-spinning moves on Wall Street show that no one can say for certain how Trump's volatile trade agenda will play out. Can his administration negotiate better trade conditions with China before the situation gets out of control? "The market is now worried about an escalation into a full-blown trade war," Morgan Stanley equity strategist Michael Wilson wrote in a report on Monday. "While it is difficult to know how trade tensions will pan out in the end, the good news is that a bad scenario is quickly getting priced in," he wrote. 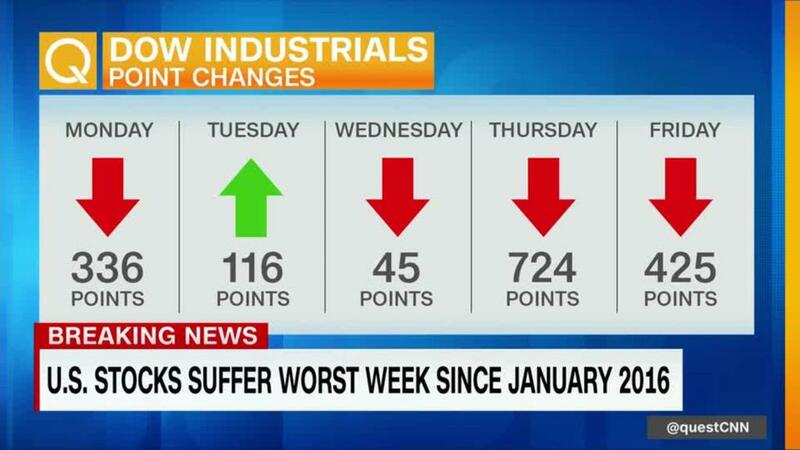 The Dow plunged more than 1,100 points during the final two trading days of last week alone. The heavy selling left the index at a four-month low and back in correction territory, more than 10% below its all-time high in January. Investors had largely ignored the threat of Trump's protectionist trade policies for months. Those concerns are front-and-center now. The fear is that Trump's tariffs on China will spark such a ferocious response that it will slow what it otherwise strong global growth. It's reasonable to worry about trade. No one wins a trade war, and one between the world's two biggest economies would be particularly concerning. Major American companies including Starbucks (SBUX), Boeing (BA), Apple (AAPL) and Qualcomm (QCOM) rely on China for a sizable portion of their sales. But China and the United States remain far from an all-out trade war. China has so far avoided an aggressive response. China has threatened to impose tariffs on American fruit, nuts and other products to retaliate for Trump's steel and aluminum tariffs. But even those amount to only $3 billion of exports per year. And recent history shows that Trump's trade bark can be greater than his bite. "Everyone needs to take a deep breath: This is not 1930, and Smoot-Hawley all over again," Pantheon Macroeconomics chief economist Ian Shepherdson wrote in a report on Monday. Shepherdson noted that global trade flows plunged 66% after the United States imposed a wave of tariffs in the 1930s, deepening the Great Depression. Trump's China tariffs amount to about $15 billion per year, or about 0.08% of the US economy. While Trump's reversal of modern trade norms is "terrible and alarming," Shepherdson said the tariffs "won't kill the economic expansion." Related: What happens when two huge economies turn on each other? Wall Street is hoping the tariffs never even become a reality as Washington and Beijing work on a resolution. Treasury Secretary Steven Mnuchin told Fox News on Sunday that he's "cautiously hopeful" the two sides can reach a deal. US officials want China to reduce tariffs on American cars, spend more on US semiconductors and offer greater access to the Chinese financial sector, The Wall Street Journal reported. A Treasury Department spokesperson declined to comment on the report. Trump's much-feared tariffs on steel and aluminum imports were watered down substantially. First, the administration granted exemptions for Canada and Mexico. Then major allies including the European Union, Australia and South Korea were spared as well. After declaring a free trade agreement with South Korea "horrible," Trump reached a deal to revamp that deal on Monday. Capital Economics said South Korea emerged from the negotiations "unscathed" and with minimal concessions despite Trump's threats. Greg Valliere, chief global strategist at Horizon Investments, predicts a similar outcome for Trump's trade spat with China. "This will be classic Trump — he has bombastically appealed to his base, and will get something from China after he backs down on radical proposals," Valliere wrote in a report. "The markets should ignore the hype." That is the hope investors displayed on Monday as US stocks recovered a chunk of last week's losses. Morgan Stanley's Wilson characterized Trump's tariffs as a "negotiating ploy" and urged investors to buy stocks at these beaten-down levels. "We are confident purchases at current prices will prove to be a very good entry point for an eventual move to new all-time highs this summer," he wrote. But there remains a risk of a miscalculation by either Washington or Beijing that backfires on the global economy. And talks may linger without a resolution, denting confidence among businesses and consumers in the meantime. "While we welcome the rally, we fear that it's too much too soon as the trade situation is far from settled," Michael Block, chief strategist at Rhino Trading Partners, wrote in a report on Monday. —CNNMoney's Jethro Mullen and Daniel Shane contributed to this report.